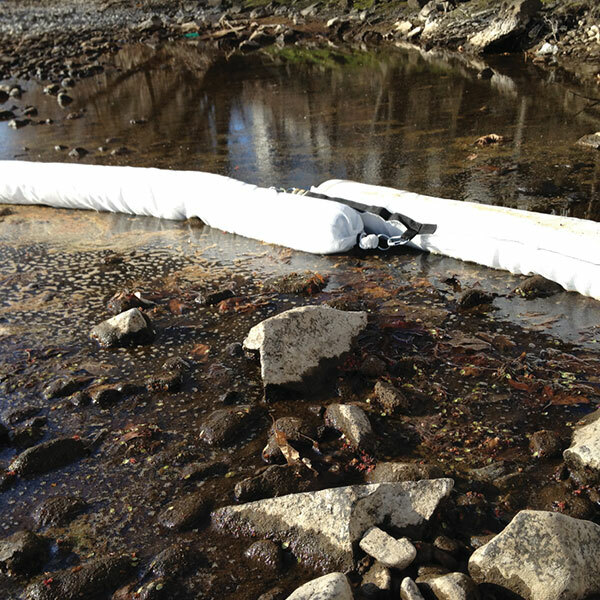 IWT carries a wide variety of spill response products. Our most commonly used products for construction jobsite and marine applications are shown below. If you need a product you do not see listed, please call our sales office at 609-971-8810 . Linkable booms contain and absorb spills both on and off water. The built-in stainless steel connectors link booms together to cover large areas of water. 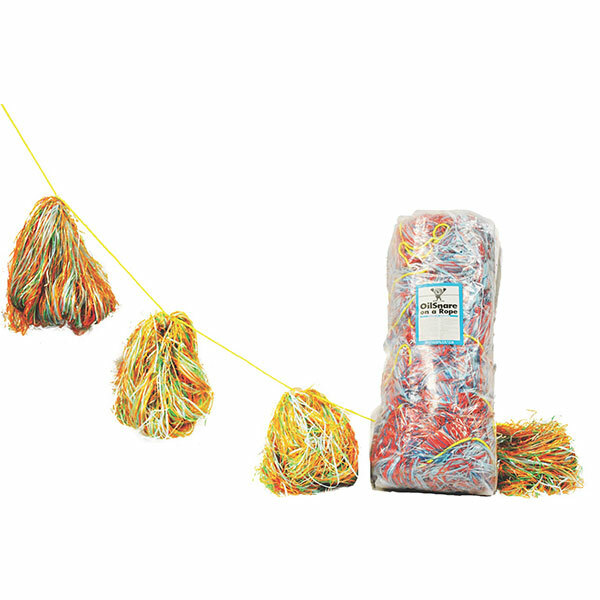 In addition, booms are encased with a lint-free poly sock that prevents shedding. 8″ x 10′, Lint-Free 65 gal/bale 4 booms/bale 40 lbs. 5″ x 10′, Lint-Free 35 gal/bale 4 booms/bale 24 lbs. 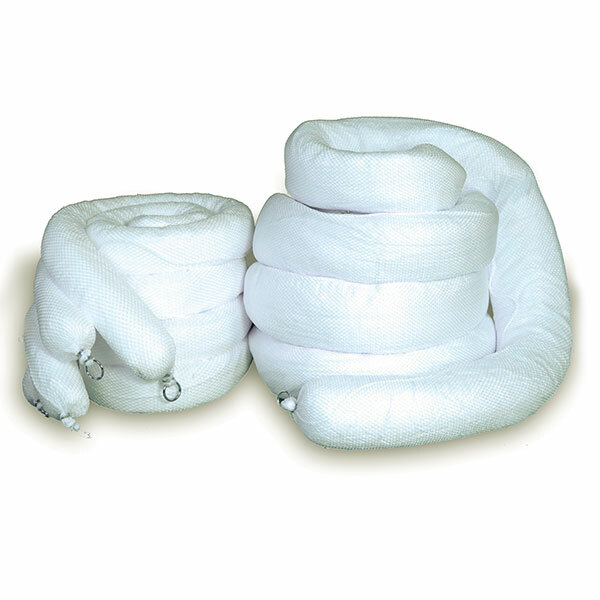 3″ x 20′, Lint-Free 12 gal/bale 2 booms/bale 10 lbs. Designed for use in harsh marine environments where rocks and barnacles will rip and tear standard sorbent booms and cause the shredded polypropylene to release, making more of a mess than when you started. Boom XT is made from HDPE netting, which is a lot stronger than traditional boom nets. In addition, the HDPE netting is UV-treated to protect the polypropylene from the sun’s damaging UV rays. 8″ x 10′ Dura net/ poly filler 65 gal/bale 4 booms/bale 42 lbs. 5″ x 10′, Dura net/ poly filler 35 gal/bale 4 booms/bale 24 lbs. 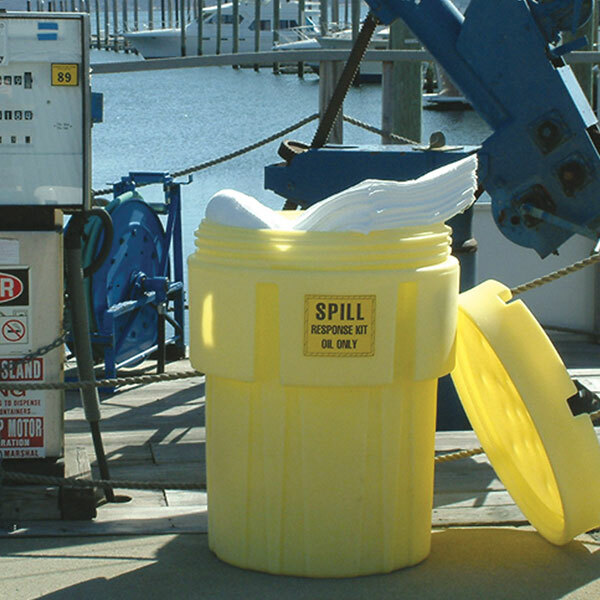 Designed for rapid spill cleanup/containment on or off water. Reinforced nylon straps and laminated spunbond fabric provide extra strength for towing capabilities. Sweeps are ideally used to remove thin slicks off water. 19″ x 100′ w/straps 18 gallons/bale 1/bale 13 lbs. Oil Snare™ products were developed for the recovery of Bunker C, Crude Oil, and Numbers 4, 5, & 6 oil. Oil Snare utilizes the oil’s natural stickiness to entrap it within thousands of plastic tentacles. Operative even in subfreezing conditions. Oil Snare is hydrophobic, oleophilic, non-toxic or corrosive, non-scattering, inert, floats (will not sink) indefinitely. Oil Snare is also resistant to rot and mildew after long storage and does not have a shelf life. Oil Snare products can be drained or doused with #1 or #2 oil which removes the heavy oils, allowing units to be reused if desired, and allowing recycling of extracted oil as downgraded fuel. Oil Snare Single Polypropylene ribbon 30/bag 19 lbs. Oil Snare on a Rope Polypropylene ribbon 30/50′ rope 19 lbs. Quick absorbing and highly versatile. Used for cleaning spills on both land and water. 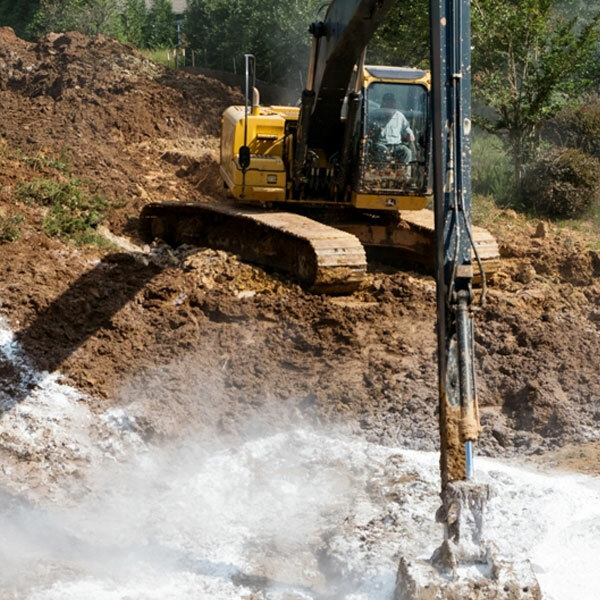 These low cost sorbents are ideal for a variety of environmental applications. 15″ x 19″, Double Wt. 34 gallons/bale 100/bale 15 lbs. 15″ x 19″, Economy Wt. 20 gallons/bale 100/bale 9 lbs. 15″ x 19″, Medium Wt. 27 gallons/bale 100/bale 12 lbs. 15″ x 19″, Single Wt. 36 gallons/bale 200/bale 16 lbs. 30″ x 30″, Double Wt. 53 gallons/bale 50/bale 23 lbs. 30″ x 150″, Double Wt. 64 gallons/roll 1 roll 28 lbs. 30″ x 150″, Medium Wt. 51 gallons/roll 1 roll 23 lbs. 30″ x 300″, Single Wt. 68 gallons/roll 1 roll 30 lbs. 15″ x 150″, Double Wt. 64 gallons/bale 2 rolls 28 lbs. 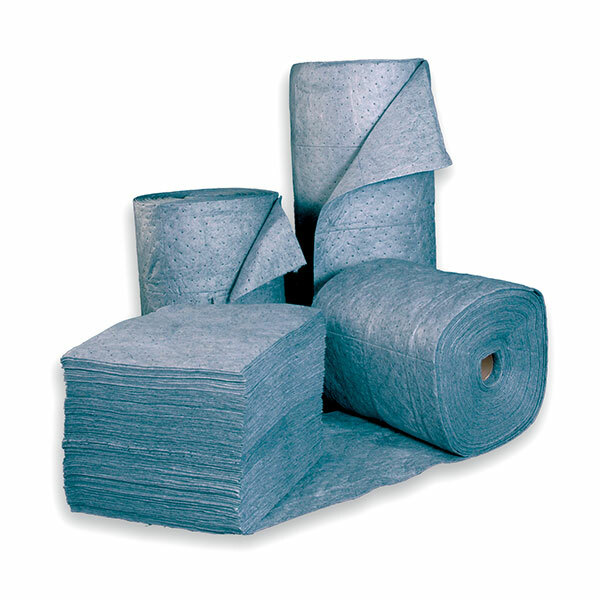 Bonded pads and rolls share the same features as our standard melt-blown plus an extra layer of spun-bond polypropylene. The bonding process adds increased strength and lower lint. They also provide a cleaner and safer working environment. 15″ x 19″, Double Wt. 30 gallons/bale 100/bale 15 lbs. 15″ x 19″, Medium Wt. 25 gallons/bale 100/bale 12 lbs. 15″ x 19″, Single Wt. 32 gallons/bale 200/bale 16 lbs. 30″ x 30″, Single Wt. 46 gallons/bale 50/bale 23 lbs. 15″ x 18″, Double Wt. 20 gallons/bale 100/bale 9 lbs. 30″ x 150″, Double Wt. 656 gallons/roll 1 roll 29 lbs. 30″ x 150″, Medium Wt. 47 gallons/roll 1 roll 23 lbs. 30″ x 300″, Single Wt. 59 gallons/roll 1 roll 30 lbs. 15″ x 150″, Double Wt. 56 gallons/bale 2 rolls 29 lbs. Muscle Wall was engineered and designed to provide superior primary and secondary containment. Muscle Wall can be deployed and taken down with just a small team of workers and without the aid of heavy equipment. 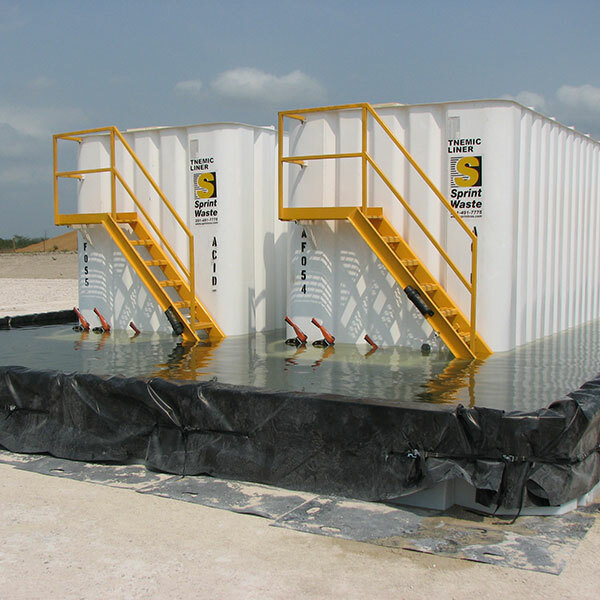 In fact, a 2-foot secondary containment big enough to house a standard frac tank can be set up in just 30 minutes. Contact our office at 609-971-8810 for further information. Muscle Wall was engineered and designed to provide superior primary and secondary containment. Muscle Wall can be deployed and taken down with just a small team of workers and without the aid of heavy equipment. In fact, a 2-foot secondary containment big enough to house a standard frac tank can be setup in just 30 minutes. Contact our office at 609-971-8810 for further information. 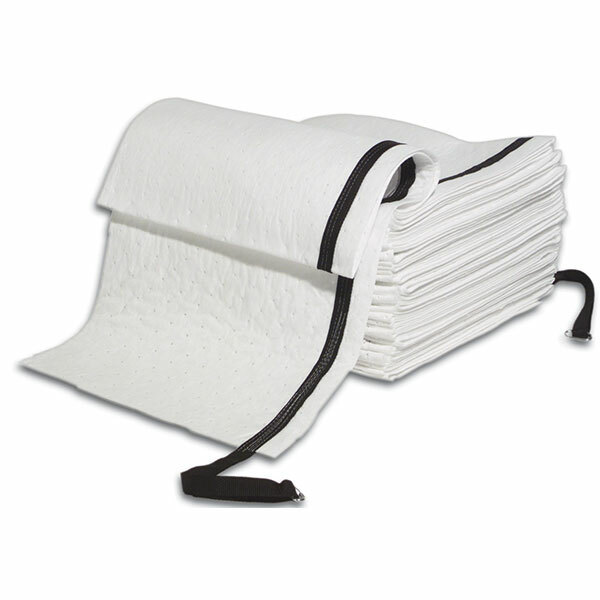 MOBILEGUARD™ reusable spill containment pads create a seamless barrier for true protection from small leaks and spills during operations. MOBILEGUARD pads use proprietary modified polyurea lining and coating technology. This liner technology maintains impermeability and puncture resistance under exposure to harsh UV and weather extremes, resulting in long life with minimal maintenance requirements. More durable than competing products made from PVC vinyl or other materials, the liner is applied directly to the floor and foam side walls to create a seamless berm that resists blow-outs even when driven over with heavy equipment. 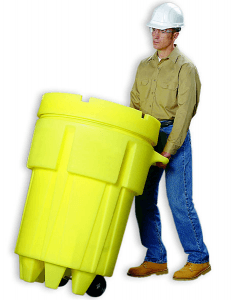 55 Gallon Poly Drums are designed for disposal of moderate to large amounts of used oil absorbents. Available in open or closed head, and in blue or translucent. Perfect for temporary storage of spent sorbent products. 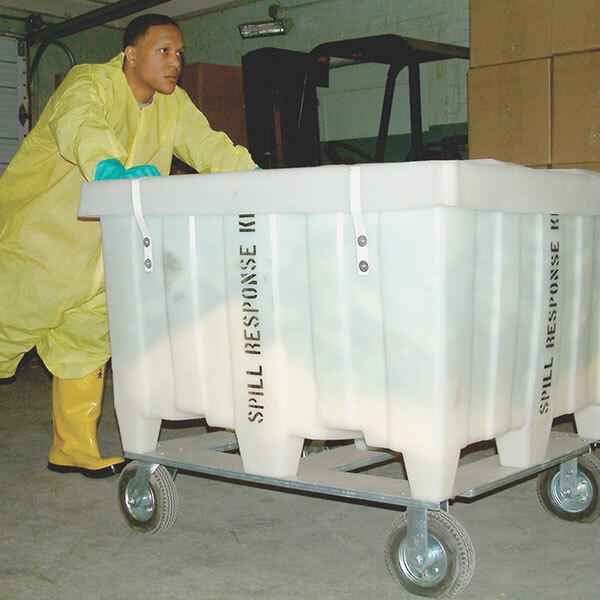 65 Gallon Overpacks are DOT-approved and perfect for transportation of used sorbent products or hazardous waste. A 30 gallon drum or lab pack fits securely inside for increased secondary containment protection. Screw-on lid for secure transport to disposal site. 95 Gallon Overpacks are DOT-approved and available with wheels to help transport the full overpack. A 55 gallon drum or lab pack fits securely inside for increased secondary containment protection. Screw-on lid for secure transport to disposal site. 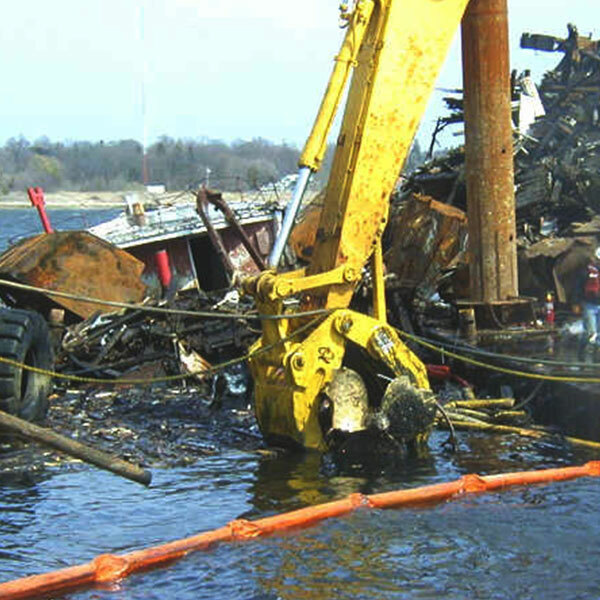 Response time is crucial when it comes to cleaning a fuel or oil spill on water. The faster you respond, the easier it is to minimize damage to the environment and avoid costly fines. This kit provides you with almost everything you need to become an efficient first responder. Everything you need for a complete and thorough cleanup of small or large industrial spills. Kits are available in Oil Only, Universal or Hazmat. In addition, we offer custom kits designed to meet DOT requirements. 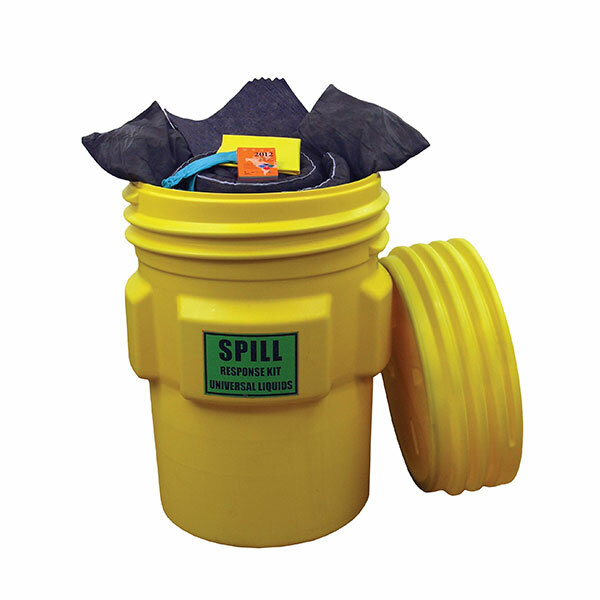 Everything you need for a complete and thorough cleanup of small or large industrial spills. 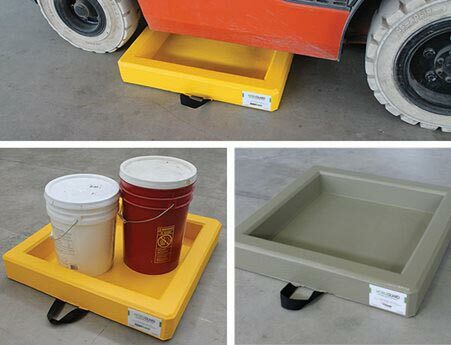 Spill kits on wheels designed for maximum mobility and are available in Oil Only, Universal or Hazmat. In addition, we offer custom kits designed to meet DOT requirements. 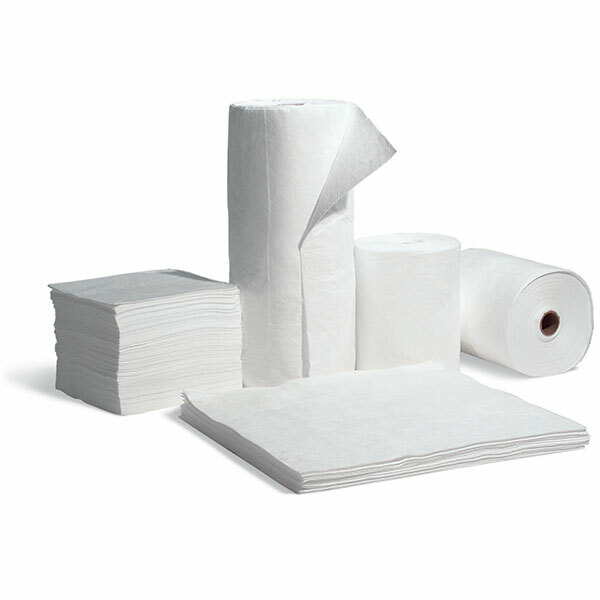 Super Absorbent Polymers are also a cost-effective alternative to other bulk sorbents. Kiln dust, portland cement, or sawdust can add volume and weight to a load. In fact, they can double​ or​ triple the volume!​ This extra volume increases both transport and disposal costs. Since the polymers reduce volume and weight, costs are reduced as well. 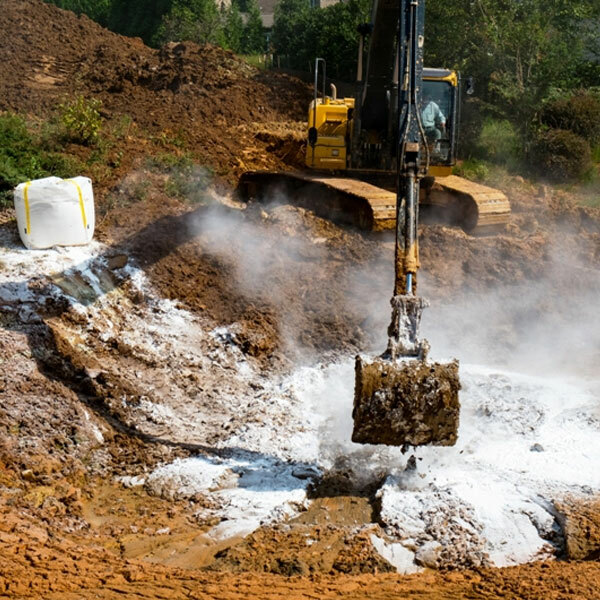 Some of our clients ship contaminated soils to destination landfills by rail. 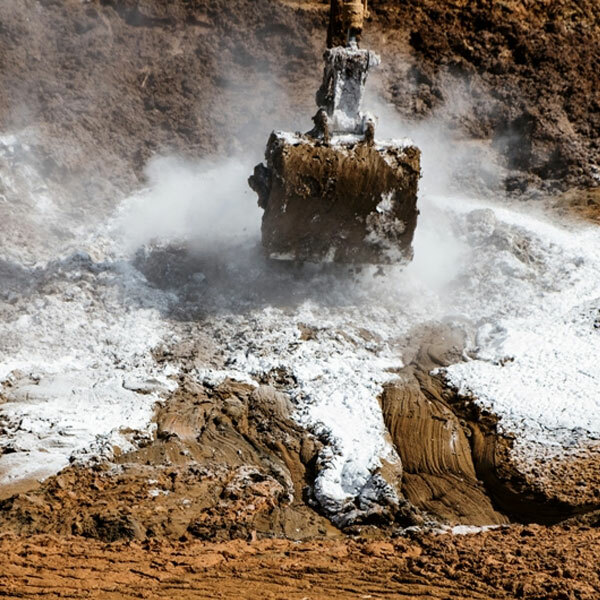 The EPA requires that liquids in the soil be in a solid form prior to transport. Therefore, adding Super Absorbent Polymers during the loading process is an effective solution. They safely solidify both hazardous and non-hazardous wastes. They are ideal for use with our Black Stallion Rail Gondola Liners​ and other applications. Please call us at 609-971-8810​ so we can help you select the right material for your needs. These super absorbent socks are made with a blend of recycled cellulose and SAP (super absorbent polymer). Locks water in place to prevent leaching. Ideal for use in a tailgate to prevent leakage. 7″ x 8′ 41 Gallons 5/bale 40 lbs.